Black holes do have a shape! Black holes are interesting objects; they were first suggested by people tinkering with our understanding of how gravity works as a completely theoretical object. Someone (by the name of John Michell, way back in 1784) realized that if you had a sufficiently compact, massive object, the escape velocity — the speed needed to escape from the surface and make it out into orbit and beyond — would be faster than the speed of light. As we know, nothing moves faster than the speed of light, which means that these objects are just a trap for anything that comes close enough to get dragged close. Since the original suggestion that these objects might exist, we’ve since found things out in the universe that can only be explained if there’s a black hole there. A black hole is therefore a region of space that is totally, utterly dominated by the force of gravity. Gravity functions equally in all directions, which means that it will pull all things towards a central point. 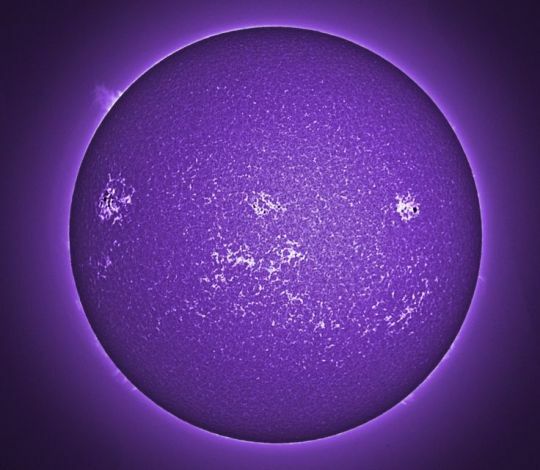 We can take a hint by looking at the Sun, which is fundamentally just a cloud of gas being irresistibly compressed by gravity — and it’s pulled into an almost perfect sphere. 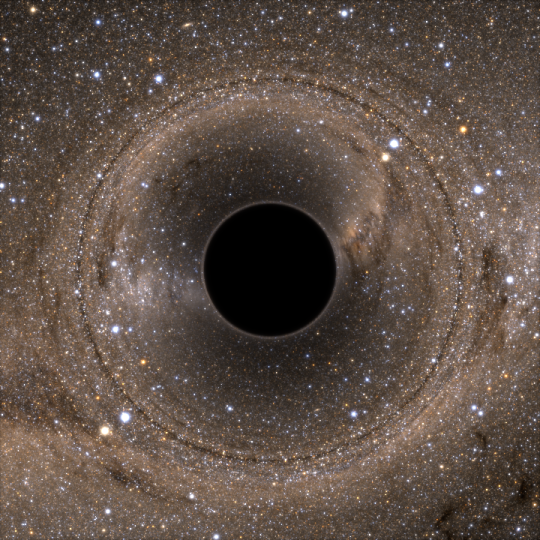 Black holes are also spheres, and are probably some of the most perfectly round objects in the universe. A close second place goes to neutron stars, which are slightly less dense than black holes — they don’t quite have enough mass to collapse down to that level — and light, though extremely distorted by the neutron star, is still able to escape. Since they’re spheres, in principle there’s no up, down, or sideways to them. And, if the black hole is totally isolated, this is the case. Any direction you look at them, they’ll still look like a circle of utter blackness, surrounded by a ring of light — this ring of light is from objects behind the black hole. 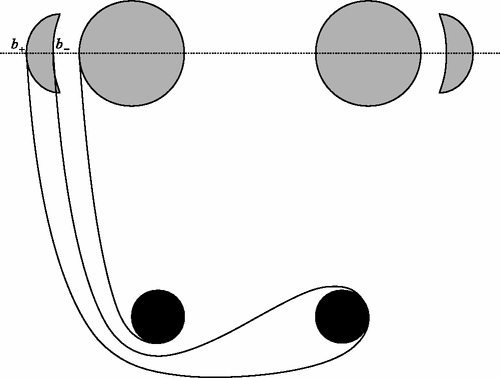 Light certainly can’t make it out of the black hole once it makes it in, but the light can also take a curved path, coming out of its curve once it snakes around the black hole. In this case — if the black hole is isolated — the only change you would see based on your point of view would be the backlighting. The more objects behind the black hole, the brighter the ring of light would appear. If you happened to look towards the black hole with very little behind it, the ring would be much dimmer, or absent. However, black holes aren’t always isolated. If they form as a part of a two-star system, where one star is a bit larger than the other, the larger star can collapse to form a black hole before the other one is done burning through its fuel. In this situation, the black hole will start to siphon gas off of the surface of the other star, pulling it in towards itself. The black hole itself is probably rotating (since the star it formed from was almost certainly rotating initially, and angular momentum is conserved), and it wraps the gas from the other star around itself, which forms a disk of material around the black hole. Now, thanks to the presence of this accretion disk, there’s a direction to the way we see the black hole. If you look down on the disk from the top, you’d see the black hole, plus the glowing disk of gas surrounding it. Or, more likely, you’ll be looking straight into a jet of superheated material, being flung away from the black hole. There are two other situations in which you might see some weird things around a black hole, which would make them look extra bizarre. The first is if you have two black holes orbiting each other. 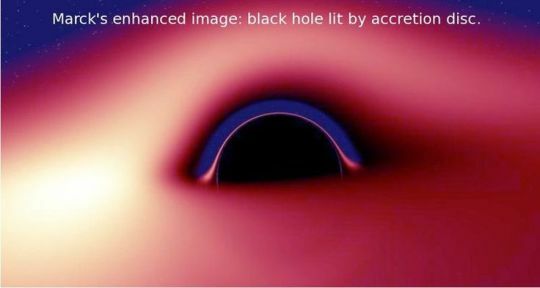 The way that light gets distorted around both of these extreme phenomena is pretty incredible, and you wind up with something that’s been technically called “an eyebrow” popping out over from behind the black hole in front. They’re also referred to as “black hole shadows” which is just as great, name-wise. If the two black holes are orbiting each other closely enough, not only do you get some great visuals, but eventually the two black holes will lose enough energy to merge together. 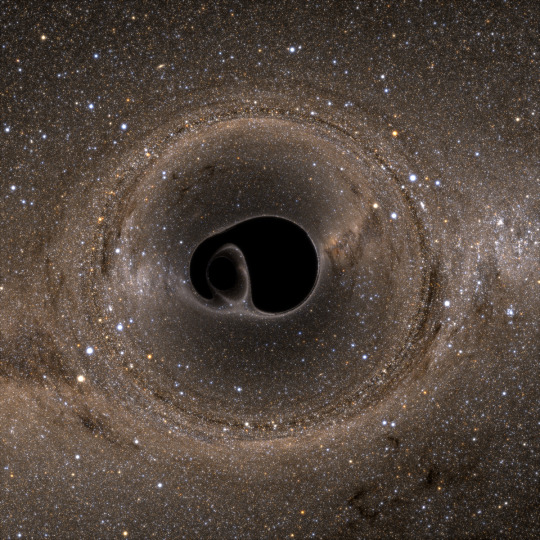 In that instant of merging, the black holes are a single object. There’s a single region of space from which light cannot escape, but this is very much not a round region. The newly formed larger black hole will quickly become reasonably round-ish, but it has to go through a reasonably long process called “ringdown” to settle back down into a perfectly spherical object, the way it was before the other black hole smashed into it. If ringdown sounds like a melodic term to you, you’re spot on — it’s meant to evoke the gradual dimming of sound that comes from a bell after being struck. The bell continues to vibrate long after the initial strike, carrying a tone at a quiet level much longer than you might think. So it is with black holes — after the initial strike of the companion black hole, they continue to vibrate for a long time, gradually losing energy to space until they find themselves back the way they started — isolated spheres of gravity’s total dominance. So, in general, if you find a black hole floating out in the blackness of space, it will look like a perfect sphere, surrounded by a ring of whatever light might be behind it. If you find one with a nearby star, it will be partially obscured by a glowing, red-hot disk of gas — and if you’re lucky enough to see two of them orbiting each other, you’re in for a treat of black hole eyebrows and space bending before your eyes.